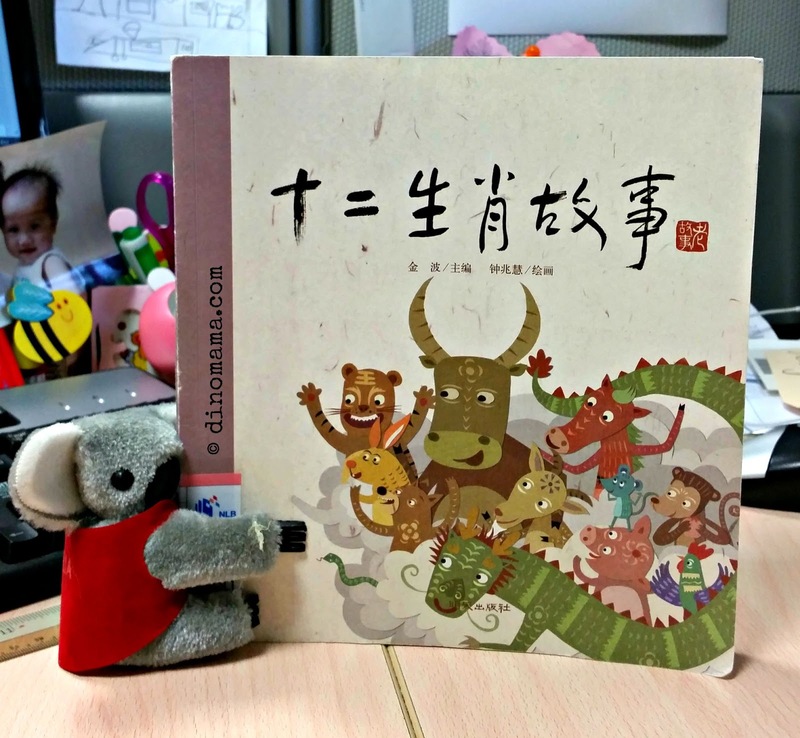 This story needs no further introduction coz all Chinese knows about the Chinese Zodiac sign but a few, me included, may not know the sequence by heart, I only know Rat, Ox, Tiger and can't get past beyond that haha~ Yupe its that bad. For my foreign friends reading this let me share a little bit of the Chinese astrology with you. Similar to the western astrology or Horoscope, the Chinese version or Chinese Zodian or Sheng Xiao is based on a 12 year cycle hence the 12 animal signs namely Rat, Ox, Tiger, Rabbit, Dragon, Snake, Horse, Goat, Monkey, Rooster, Dog, and Pig. 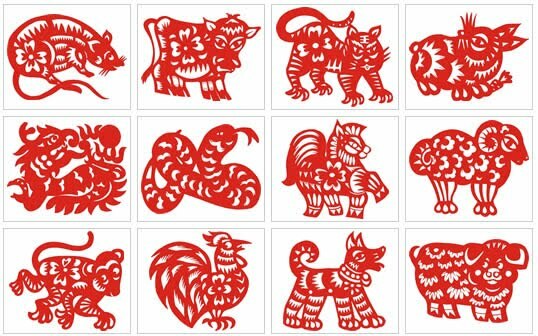 Each year cycle will be represented by each animal, and like the Horoscope, the Chinese believe that the animal ruling one's birth year will have strong influence on the personality and destiny. So anyway, we know roughly the 12 Zodic signs and there are many versions to the ranking of the 12 animals but all of them are fun to read about. And since its a familiar story, it is not difficult to read and understand the story. 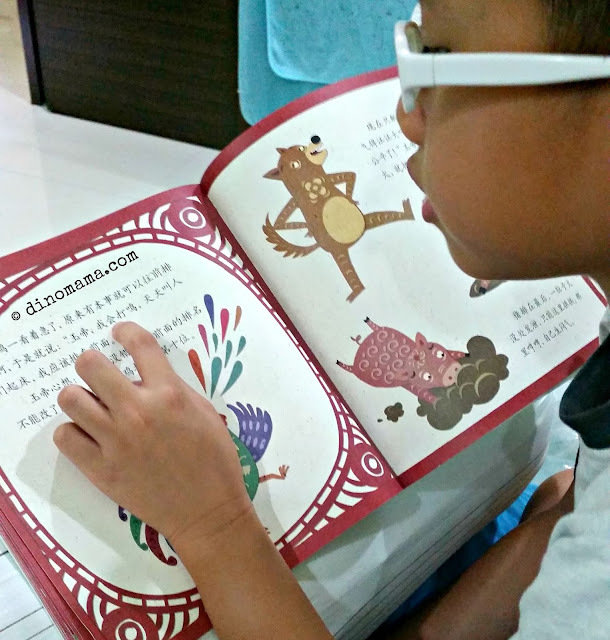 The words in this book are fairly easy to read and understand, it also describe the characteristic of the animals like the Rooster crows to wake people up, Dragon summoning the cloud and winds. 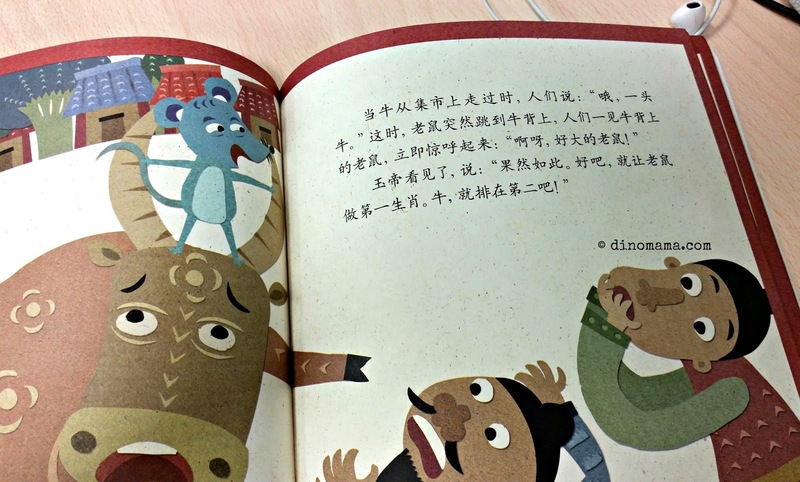 DinoBoy was puzzled when the book described that the Horse is a 千里马 which he thought was Thousand Mile Horse. I explained to him that in ancient days, people used to travel on horse backs and some of the finest horses can run non stop for a far far distance and uses 千里 or thousand miles to describe the long distance they ran.